For just over a year, I’ve been building Dachis Group, a company focused on social business design. I joined Jeff and we brought Kate, Ellen, Jevon, and David on board. This team has been carefully selected for its skills. Today, we add global scale via the acquisition of Headshift, a social business consultancy with offices in London and Sydney. Organizations across the globe are starting to see social media’s true potential as social business. Accordingly, complex issues like integration and scale can be solved by constructing a solid strategic foundation. 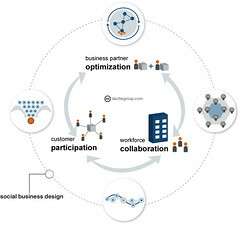 Social business design provides this strategic foundational approach to a business across three core areas: business partner optimization, workforce collaboration and customer participation. These three areas present opportunities for improved outcomes ranging from cost savings to new product/service innovations and increased revenue streams. These outcomes materialize when organizations connect and expand their ecosystems, evolve toward a more open culture and empower employees, and engage business partners and customers to actively participate in their business. The acquisition of Headshift will allow us to meet increasing demand from global organizations to create social business. The official details on the deal can be found here. For more on the Dachis Group and our services, download our fact sheet. If you’re not familiar with Headshift, I encourage you to benefit from the insights shared on their blog from Lee Bryant, Livio Hughes, Anne Bartlett-Bragg, and team. Neville Hobson: Is ‘social business’ the new black? Interested in discussing how social business design might apply to your company? Let us know. Next PostNext Are you a five-tool employee?